Therefore I endure everything for the sake of the elect, that they too may obtain the salvation that is in Christ Jesus. 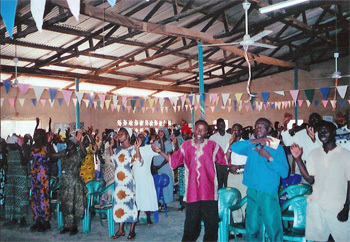 Altar call to receive Christ at a crusade in the capital city of Accra in Ghana. 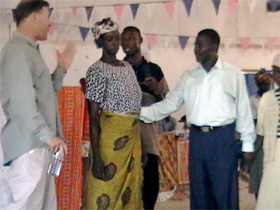 We just returned from a one-and-a-half-month mission trip to Ghana, West Africa. It was definitely an arduous trip but also a very fruitful one. We preached at the Assemblies of God Christmas Convention in the unreached Upper West Region and did three crusades in the capital city of Accra. Over 80 people made decisions for Christ while we ministered and there were even more healings, miracles and signs and wonders. It was an adventure in stepping out in faith and trusting God in the midst of trying circumstances, as well as experiencing a different culture, climate, people and way of life. Ghana is definitely an interesting place and a very hot one too. It was formerly called the Gold Coast and was a leader in the deplorable slave trade in centuries past. It was also the first country in Sub-Saharan Africa to receive its independence. We had been invited to come to Ghana for a number of years but the cost of going was so high we never felt we could do it. But God led and gave us powerful confirmation (the story can be read on the next page) and did incredible miracles just to get us there, which was all definitely needed when we began to realize what we were getting into, as far as the heavy costs of getting there and the enormous amount of health risks one takes in going to these areas. Malaria as well as other diseases are endemic, like Schistosomiasis, Tuberculosis, African Sleeping Sickness, hookworm and on and on. We felt such pressure already from just the cost: each plane ticket was around $2000, and the necessary inoculations (they don’t even cover the diseases we’ve mentioned but rather a host of other ones) and preventive medicines were over one thousand (we’re still paying some things off from this trip). Not only were the costs and health risks weighing heavy on our hearts already, which were compounded by bringing Patrick along, but the day before we left, the US State department issued a warning against Americans traveling to Ghana at that time. This was not uplifting information to receive the day before we were to leave when the pressure was weighing heavy on us already. Satan truly attacked our hearts but God spoke that he had called us to go and He would go with us. Like someone walking out on a limb and waiting for it to break, we found that the hand of the Lord was there holding us up at all times. The Lord brought forth a great harvest as we ministered extensively in both the capital city of Accra and in the rural area of the Upper West in the Sahel, the desert area south of the Sahara which cuts across Africa, not as extreme as the Sahara but still hot and dry enough to dehydrate and give you heat stroke in a very short time. If you’ve seen the Dakar Motor Race on TV near the final legs, it is the same type of topography. 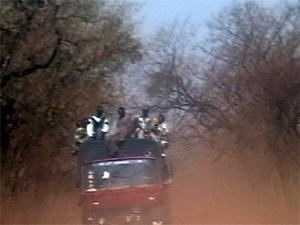 We were all the way out by the border with Burkina Faso in a town called Jirapa. That we even made it out to that area at all was a miracle. Scenes from the 17-hour drive to the Sahel Region. 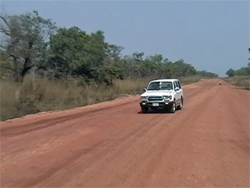 Right picture shows the long and bumpy road. On the left: When there are no more seats, they just ride on top! The transportation was not set up for us to get out to Jirapa when we first arrived in Accra, Ghana, and we had very few options available to get to such a rural location. The only public transportation was very risky for us from what we heard from locals and read in both the local newspapers and tourist books, which described frequent luggage theft, cramped conditions where everything from chickens to goats are brought along; we even saw buses with cows tied to the roof! Furthermore, the one person per seat rule is not observed, and health risks abound, including tuberculosis and the dreaded Tse Tse fly, which attacks large moving vehicles by flying through the window and biting people, causing African sleeping sickness, an incurable disease. (We had a close call with a Tse Tse fly even in a passenger car but killed it before it could bite us). 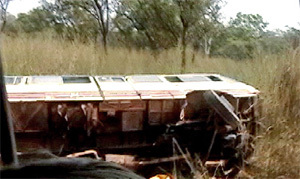 If one of the public buses breaks down, which they regularly do—broken down buses along the side of the road are a regular sight—it can be days before another comes to get the stranded passengers. We did some serious praying in the hopes of being able to get out to Jirapa and back safely to preach at the convention. God heard our prayers and intervened through the General Superintendent of the Assemblies of God (A.G.) for all of Ghana, who offered to have his own personal driver take us out and back in an SUV sufficient for the task. After 17 hours of the most potholed roads you could imagine through the rainforest, to the most washboarded dirt roads in the Sahel dessert, passing through little mud hut villages and areas of burning brush lit up by villagers driving out animals for hunting—so much for the idea of indigenous people living in harmony with nature—we finally made it out to Jirapa. We were the key speakers and preached night and day, at every meeting, at the Assemblies of God Christmas Convention in Jirapa. My throat was going hoarse by the end from speaking so much but God did extraordinary things at every meeting. The convention itself became like a whirlwind, with the evening meetings being run as an evangelistic crusade, which often had overflow crowds and people standing outside the doors. 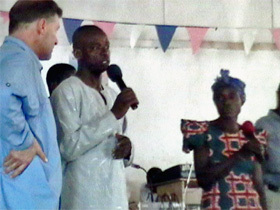 We had numerous conversions and miracles with a plethora of testimonies. While all are significant, there are some that especially stand out, like a young lady who testified that she heard of the Christian God and believed He must heal, so she came asking for healing and not only got healed of pain in her abdomen but gave her life to Christ in response to His touch. Another young woman had ringing in the ear for over a year and responded to a word of knowledge I had and was instantly healed as the ringing suddenly stopped when we prayed for her. Another person had a back condition which made movement difficult but was also healed, and as she testified she showed her new freedom of movement. Another person who had come to one of the crusades in Accra by word of a friend had difficulty walking and standing, but was able to come forward and testify of a significant healing, walking and standing with no pain as she spoke. This is just a small sampling of the large amount of healings and miracles that took place. Every day there was testimony after testimony at each meeting of significant healings and miracles along with many conversions. Even a certain church leader who had never understood the Gospel before got saved in one of the meetings. 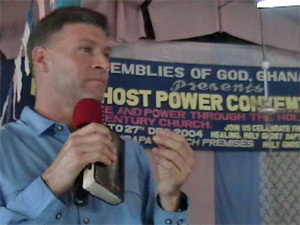 Preaching and worship at the Power Convention in Jirapa. If you would like a free video of an overview of the trip, just contact us at the info below. We also saw our share of deliverances from demons. Juju witchcraft, a very heavy form of African tribal sorcery, is prominent in certain areas, including the Upper West region where we were going. 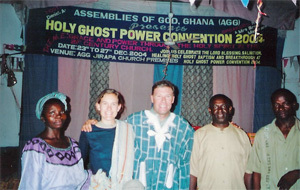 When our friend and host, Pastor Daniel—attempts on his life were made some years back when he began the work out there—was briefing us about ministering in the Upper West region, he stated that having seen how powerfully the Holy Spirit was moving in just the first few days of our ministering in Accra, he wanted us to be prepared for the possibility of some heavy power encounters. He advised me not to wear a tie when ministering or praying for people because of the possibility of a demonic manifestation getting out of hand and being choked by a demonized person via the tie. He also advised us never to pray with our eyes closed as well because of the need to be alert for any demonic manifestations getting out of control. 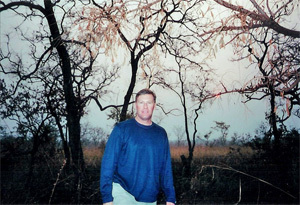 Though we did experience encounters with demons regularly, things didn’t get very out of control for the most part and there were enough strong young men who worked as a team to help control a few manifestations that did get wild. received Christ on his own volition but then everything erupted and it literally took six men to hold him down when he violently began to manifest and the most hideous noises you could ever imagine were coming out from inside of him. They didn’t come from his mouth but from inside of him and they were not human sounds, in fact a human could not make those sounds if he tried—they were like the very sounds of the pit of hell itself. Anyone who doubts the existence of hell and the devil needs an encounter with something like this to wake him up. Testimonies of healings: pain in abdomen gone; pain in back healed. Because of its close proximity to the equator, Ghana boasts some excruciating heat and humidity; in fact it can be downright unbearable. We were constantly sweating and weren’t helped by the fact that we needed to wear long pants and sleeves at all times because of the serious threat of contracting malaria through mosquitoes which are everywhere and a constant threat. West Africa has the worst and most deadly incidence of malaria in the world and it is nothing to take lightly when 1.5 to 2 million people die every year from it. Health experts recommend that every precaution be taken including wearing a new brand of clothing with Permethrin (an insect repellent) woven into the fabric, as well as using a repellent with a high DEET content on all exposed skin, 24/7. However, sweat can get the DEET in your eyes making them tear, so people probably thought I was crying when we were ministering but it was just the sweat and the DEET! 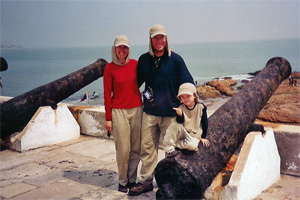 Slave forts, Cape Coast. As UNESCO World Heritage Sites, they preserve the awful memory of slave atrocities. The Europeans traded goods and guns for slaves with Africans who took captives in tribal battles. Then shipped them to the Americas. 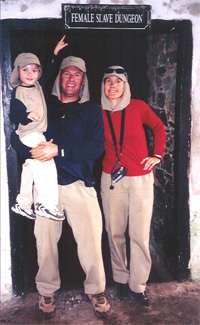 We are seen here wearing our mosquito-repellant clothing in the constant draining heat. Tribal influences and ties are much heavier than we expected even in our modern day and age. English is supposed to be the first language but is really the second after the tribal tongues, of which there are about 28 in Ghana alone. The most prominent in the city of Accra is Twi. In the rural areas the tribal influences are even heavier as would be expected, and we had some interesting experiences with them. so passing them was usually not a problem. 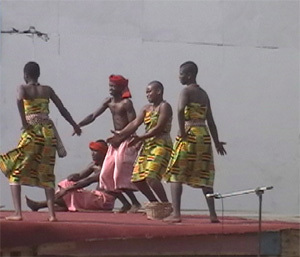 Tribal dancers performing at a park in the capital city of Accra. tribe," he said, as if we were supposed to understand the significance of this. It turns out that these two tribes are like brothers in humor who can only make jokes with one another and cannot bribe, arrest or fine one another for almost any reason. He was able to tell the guard was a Dagadi man by the certain facial cut marks which indicate which tribe a person is from. These facial marks are seen on many people, even in the cities, which was quite surprising to us who are from the Western world and haven’t seen things like this before. We were given a cultural experience and spared a bribe with this little incident, which was also God’s way of sparing us more expense. 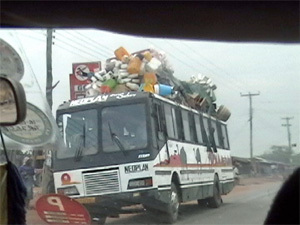 Overloaded buses (right) are a common sight, but unfortunately so are the results of such overloading: a rolled bus along the road (left). In the beginning of the trip we realized we would need some rest when we arrived to Ghana after more than 24 hours of travel to get there. We booked a few days in a hotel so we could rest up before what we knew would be an arduous time and also get a little beach and surf time in. 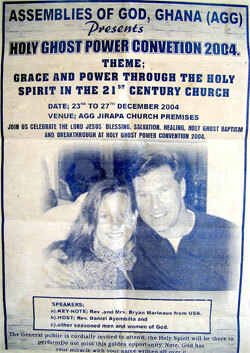 God has often used surfing to bring forth divine appointments and this trip was no exception. We came to this hotel specifically because it was near the surf and God did it again. One Monday morning before the trip, I was taking a little surf break after preaching the day before, and as I was just about to enter the water in Newport Beach a very wild thing happened. I noticed a black man in full dress clothes out of the corner of my eye over a ways walking in circles. The next thing I knew he was running over to me. He came up to me and shook my hand and introduced himself to me. We began to talk and he then shared that he was from Ghana. He told me that the Holy Spirit had just told him to come talk to me when he saw me standing there ready to go surfing. We were both awestruck and then he said let’s pray and as he began to pray he said: “The Lord says, ‘I am sending you to Ghana…’” It was quite mind-blowing but a definite confirmation of the fact that this step of faith we were undertaking was clearly God’s will. The first day of our arrival we were quite exhausted and slept much of the day. After our nap while walking around in sweats and a bad hair day, I was on my way to check out the surf when we noticed a sign on a meeting room in the hotel that said “Full Gospel.” The Holy Spirit immediately spoke to my heart to “go in that room.” I began to argue with God saying, “I’m tired and I’m not going anyplace looking like this. I’ll at least go back to the room and change first, besides I’m on my way to look at the surf.“ “Go in NOW or you will miss a great blessing,” He said. Reluctantly, I walked in and God began to immediately work in the situation. 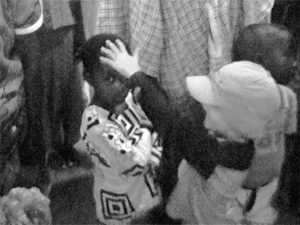 We met someone and the next thing I knew I was speaking before their group, most of whom were dressed very nicely, and then they began to pray over us for the coming mission work and all of a sudden someone was handing me an envelope, which turned out to be a donation for our upcoming trip to the Sahel, providing needed money for gas expenses. A divine appointment the first day got things off on the right foot and we had some needed rest and relaxation and some fun surf too. Like so many times, God used surfing to lead us to a divine appointment, which also brought in needed provision and encouragement. 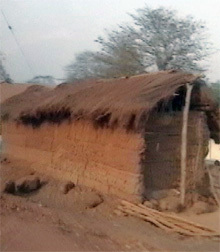 Sights from the drive through the Sahel Desert: Far right: typical mud and pole huts. 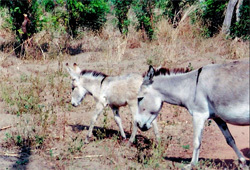 Above: animals that graze alongside and in the long dirt road. And right: Sunset in the rural region. It is much hotter than it looks! God brought in other divine provision while there too—as stated, the expense of the plane tickets had left us with little extra cash. A woman came up to us and gave us a personal donation for bottled water in the Upper West. It turned out to be the exact amount needed to cover our expenses for the many cases of bottled water we needed in the Sahel region. Bryan trying to cool off by surfing the warm, isolated waters of Ghana. With the threat of severe sunburn and jellyfish, a light wetsuit is still needed. the same thing, even for Christmas dinner, so much of the same thing everyday it was enough to make you a vegetarian but then you wouldn’t eat at all over there… On the way to the Sahel, there was also the threat of being robbed and attacked by bandits, who target foreigners especially. So we would begin our journeys around 4:00 am to avoid them. As mentioned, when we left for Ghana the US State Department had just issued a warning against traveling to Ghana at that time because of the possibility of violence or other unrest due to the upcoming presidential election. There have been coups all around that area in Africa on every side of Ghana. 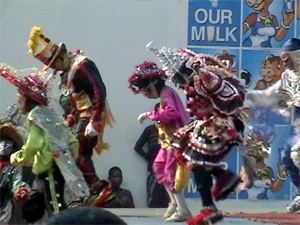 Ghana itself suffered under a military government for over 20 years up to the year 2000. They finally had an open election four years ago, but things remain volatile in some areas. Leaving the day after when the US State Department issues a warning can put you on edge as it stays continually in the back of your mind. We were woken up one night at 2:00 a.m. by what sounded like gunfire, loudspeakers and helicopters. We were becoming concerned because of the fact that Cote d’Ivoire, Togo, Sierra Leone and Liberia, all neighboring countries, are all presently experiencing unrest, coups and violence. We were thinking maybe it had spilled over into Ghana! We began to pray as we became increasingly more concerned about what we were hearing as the sounds were intensifying and growing louder and seemingly closer. “What could be happening at such an hour?” we thought; the possibilities in such a region are truly disconcerting. We decided to turn on the TV, even though there is no programming after midnight. It turned out that a presidential inauguration celebration had run extremely, extremely, extremely late (nothing new in Africa) and they were shooting off fireworks, as well as other things at 2:00 a.m and beyond! A little late to start a party but it definitely got our blood pumping and our knees knocking a bit too! Above: At the Power Convention in Jirapa with the convention leaders and organizers. Far right: Woman being touched by the power of God at one of the meetings. After returning home we also had a scare when Patrick came down with a very high fever. Having been in a malaria-endemic zone there is no place for taking something like that casually. We had to rush him to the hospital. The doctor there had been in Africa himself and was aware of the danger of malaria showing up to as much as one year after you’ve left the area, and immediately ordered a series of tests to be done. The tests came back negative; Praise God! Malaria is very dangerous, especially in children, 3000 children die a day in Africa from malaria and so we praised God that the malaria test result came out negative. 2004 turned out to be a rather full and eventful year. Not only did we take two major mission trips; one to Europe (you can read about that trip at graceworldmission.org) and the other one to Africa, but we continued with our ministry in Mexico as well. We also taught in a Bible School in the Inland Empire for two quarters on different subjects like Christian History, Hermeneutics and on the Old and New Testament, finishing the last sessions one week before we left for Africa. Needless to say, it was a very busy and stressful time. anything like this on our own (those who think people go into ministry for the money have lost their minds and don’t have a clue of the financial hardships you take on in this type of endeavor). We are now located in Oceanside and are rejoicing in our new ability to stretch our arms out a bit and not bang into the ceiling, literally: extra low ceilings were a wonderful special feature of our old apartment, can’t say we really miss them! We appreciate your continued prayers and support, it took a lot out of us financially to do this trip to Africa and we are still in the process of paying off some costs. Please consider us in your financial giving. The Scriptures say the Gospel must be preached in all the world! Yet there is a cost in carrying it out and thus your support is essential for us to fulfill what God has called us to do. 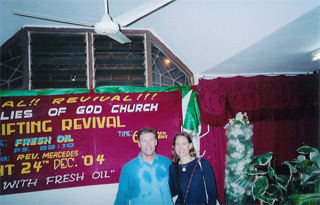 Above: Drenched in sweat after preaching at a crusade in the outskirts of Accra. Below: US State Department Travel Warning against Americans traveling to Ghana, issued the day before we left! Usually first and third Tuesday of the month at 3:30 p.m.